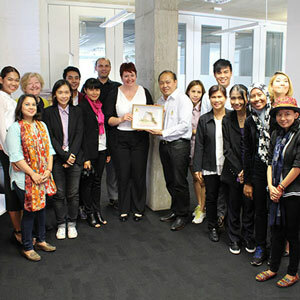 A group from Thailand attended Glasgow Caledonian University London’s first Fashion Business Summer School for academics. Staff from Rajamangala University of Technology learned about the business side of the fashion industry on the three-week course in London – the world’s fashion hub. The 12 academics from Thailand developed their understanding of branding, marketing, strategy and consumer behaviour on the bespoke course at the British School of Fashion at GCU London. They also visited major fashion houses and retail outlets such as Burberry, Grenson, Westfield and Bicester. As part of the course, they developed their own curriculum for an undergraduate degree in the business of fashion. Dr Linda Amrane-Cooper, Dean of GCU London, said: “Our bespoke programme is an exciting combination of seminars, master classes, industrial visits, group work and personal development opportunities. “Participants engage in curriculum development and explore the use of technology enhanced learning, while visits to key business leaders mean the experience is rich and highly interactive. GCU is now planning further Fashion Business Summer Schools for academics, with participants sharing their time between the University’s London and New York campuses. The British School of Fashion has pioneered courses in the business of fashion and was the first to design an MSc in International Fashion Marketing; it is one of a small number of universities worldwide to offer an MBA in Luxury Brand Marketing. The campus offers a range of MBA and MSc courses, high quality teaching and exciting links with international businesses.